The Lower Modernisms – 025. 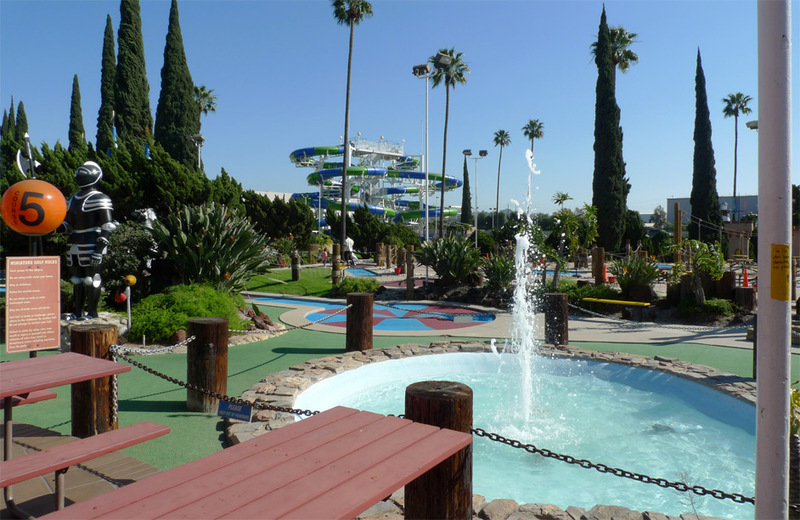 Lomo Featured Project: Camelot Golfland. Lomo Styles: Ye Olde England and others. Lomo Building Types: Amusement Architectures. August 9, 2011 by James Black. 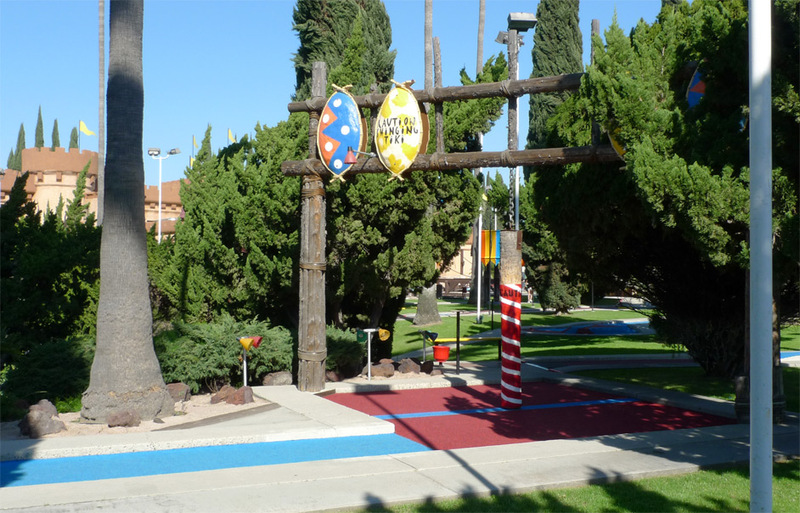 Camelot Golfland, located at 3200 East Carpenter Avenue in Anaheim just off of the 91 Freeway, is one of the foremost miniature golf venues in Southern California, and probably the whole world. 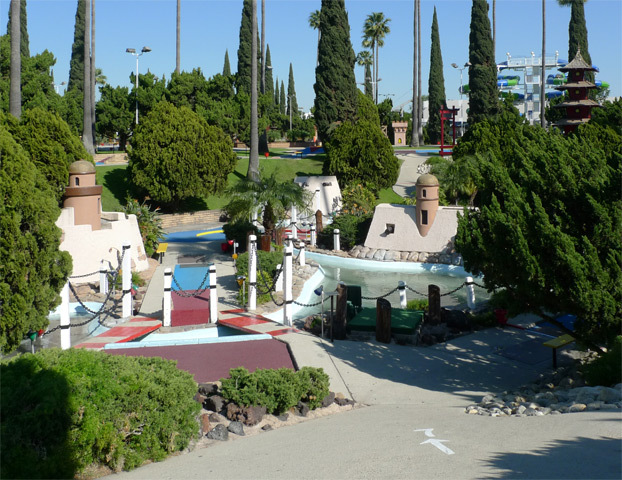 It features five 18-hole courses, an arcade that looks like a giant castle, an architectural waterslide, and a Lower-Modernist landscape design of overall high quality and integrity. 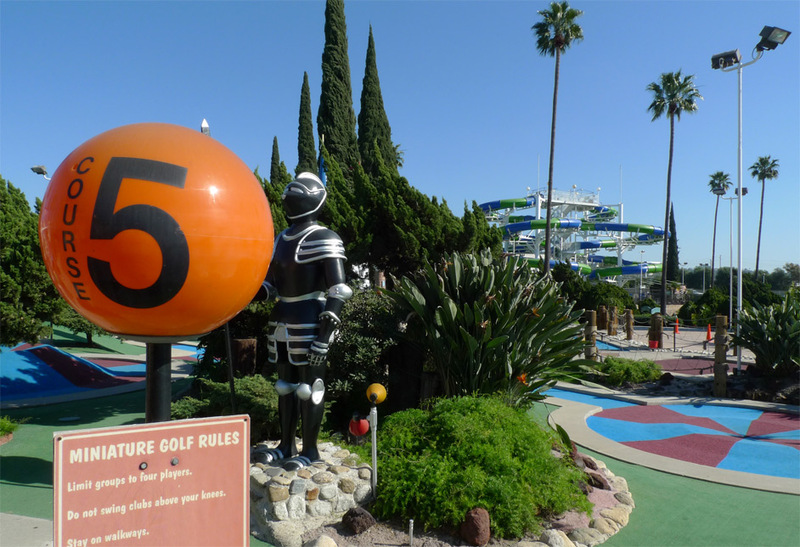 This first photograph tells much of the story of Camelot’s awesomeness, much of it derived from the spectacle of so much incongruous awesome together in one place – an orange sphere decorated with Helvetica; a robotic knight’s suit of armor standing sentry atop a plinth of river-smoothed rocks; mature lomo landscaping; the smooth, plastic forms of swooping concrete and brightly colored Astroturf; and that incomparable waterslide. My research suggests that Camelot was begun in 1975, a key date in the transformation from the open-mindedness and creativity of late stage Modernism to the dogmatic and too-often unsuccessful designs of the dark age of Postmodernism. By 1975, designers still working in a High Modernist mode had achieved a measure of ease and mastery as a dividend of the collective experience of the Modern movement. Flanking the main castle is this earthen embankment crowned with thematic architecture – appropriate graphic signage on the heraldic crests, which have a shape and proportion at home within this vaguely late-modern fantasyscape. This miniature golf design language of white poles, spherical lanterns, and decorative fountains recalls the exuberant Expo Modernism of Minoru Yamasaki’s Science Pavilion, now known as the Pacific Science Center, built for the 1962 Seattle World’s Fair. This comparison helps to clarify the kitschiness of Yamasaki’s appropriately expressive building, one of the most uninhibited designs by this patron saint of the Lower Modernisms. 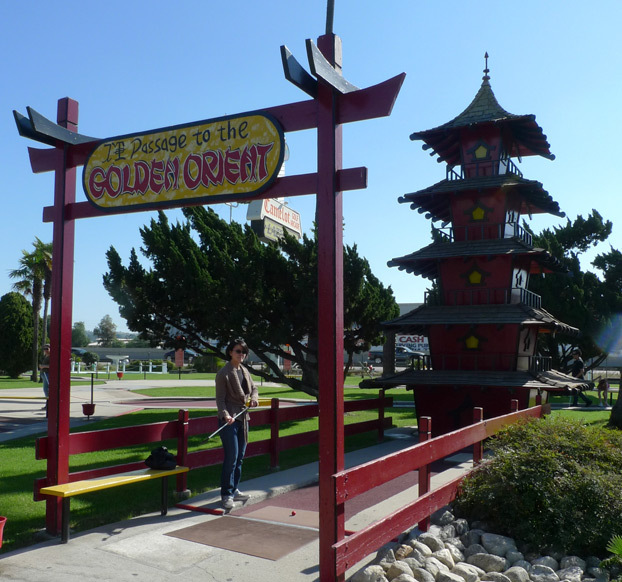 One must pass through the arcade contained within the castle (with laser tag upstairs) to the golfscape beyond. 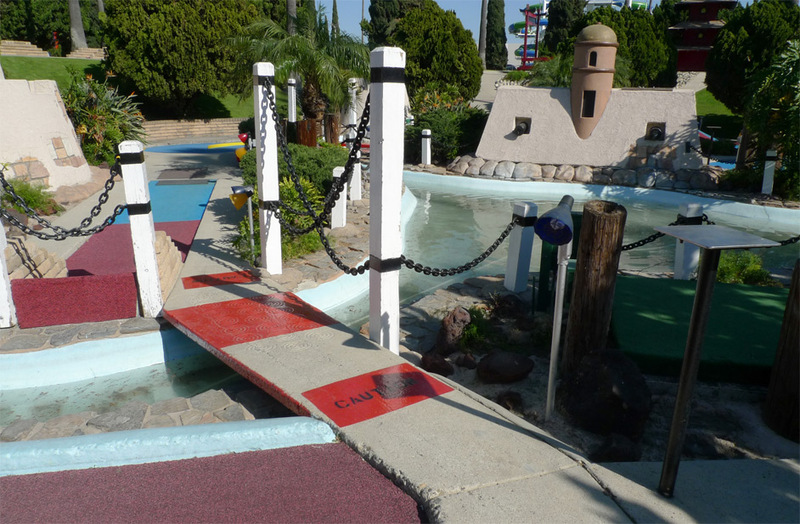 You order your golf tickets and receive your clubs while standing on a drawbridge – the customary miniature golf water hazards are repurposed here as moat. 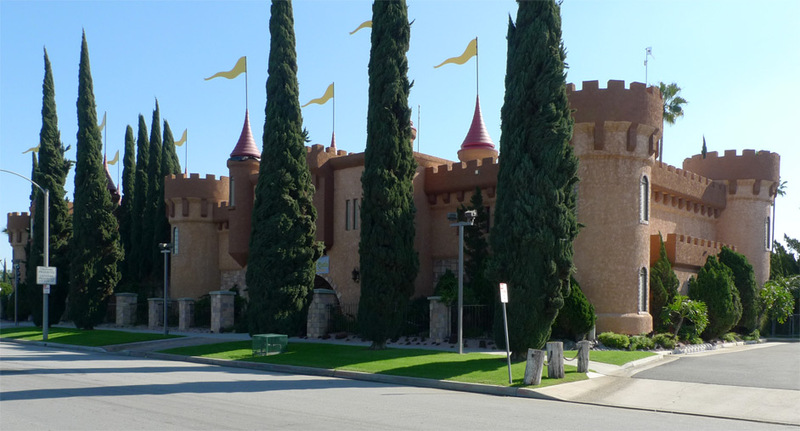 The primary design style at Camelot is Ye Olde England, a style that can be observed elsewhere in the faux half-timber style used on stucco buildings in the 1960s and 1970s to give them visual interest and strong lines, and in the civic identity program of the nearby city of Westminster. The fantastical landscape beyond reflects diverse influences, styles and tropes, and the spectacular, densely-packed visual delight of Camelot recalls not just Yamasaki’s 1962 Pavilion but World’s Fairs in general – the wildest of which was Osaka’s Expo ’70, at which the megastructure of Camelot’s waterslide would have been quite at home. 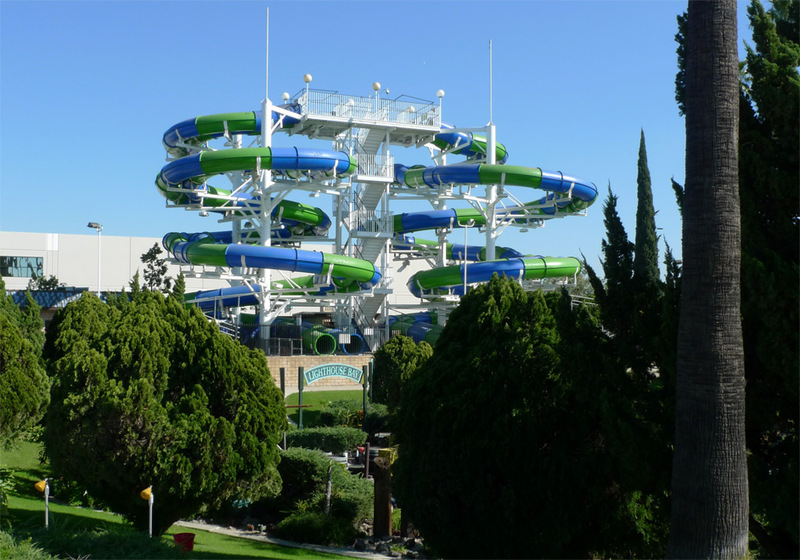 This waterslide consists of a spiral of green and blue tubing entwined around a svelte steel frame painted in white – it is industrial, but futuristic, and purely aesthetic touches like the masts that terminate in sharp spires and the spherical lamps that top the platform convey an optimism that makes my heart ache with nostalgia for the future. I can scarcely tear myself away from this image. The grounds of the golf courses are planted with modern favorites, mostly cypress and palms, which have matured over the years to impressive size. Though the surrounding area is completely flat, the surface here has been deeply sculpted, creating visual interest, making the grounds seem larger, concealing what’s around the corner, and improving the acoustics. The five courses are intertwined such that one often must follow the signage to determine where to head for the next green. Two of the 18-hole courses criss-cross in a landscape depression near the center of the grounds in the midst of these Spanish forts, interweaved with moat-like waterways. 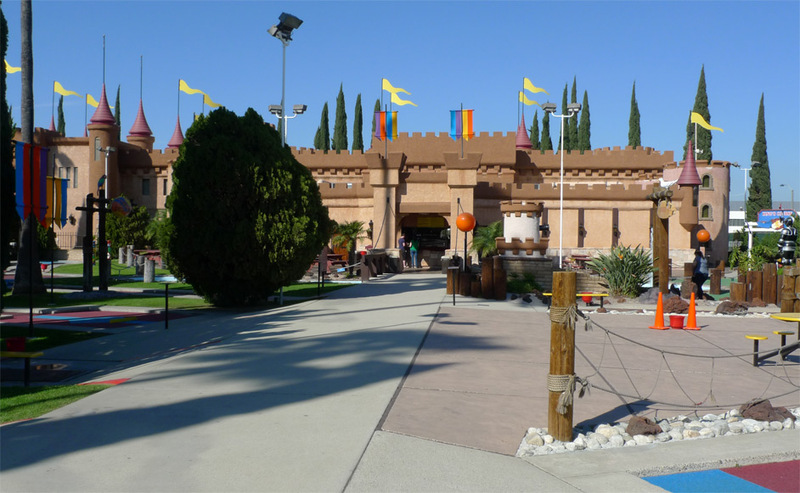 Camelot, comprising miniature golf, arcade, waterpark, lazer tag, and pizza-based snack bar, is an exemplar of amusement architecture. 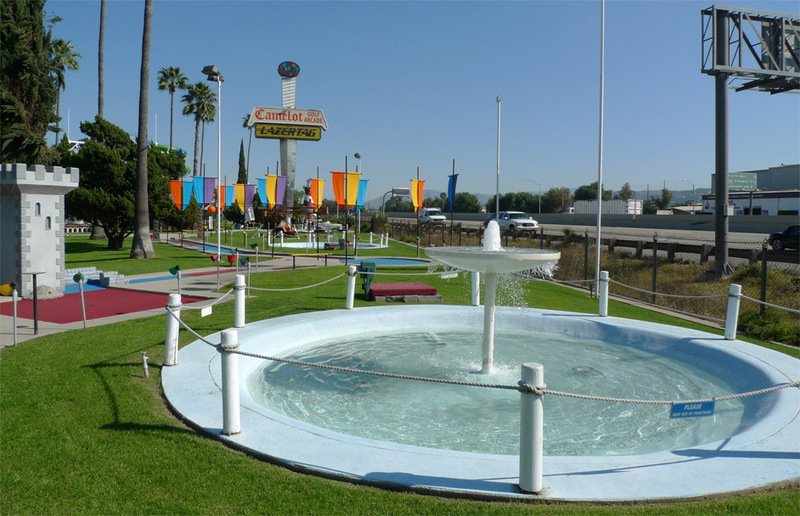 Mid-century amusement programmes such as bowling alleys, theme parks, and drive-in theaters were intrinsically disposed to pursue Lower Modernist styles. These building types encouraged a playful architecture, gratuitous in the best sense of the term. All of this action occurs literally several feet away from the rushing freeway, seen on the right in the image above. The tower signs and banner flags are meant to be enjoyed at 75 miles per hour. 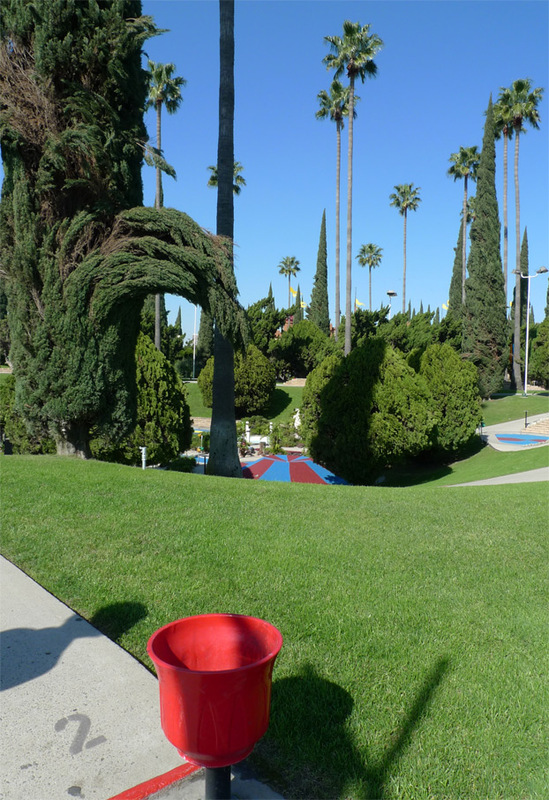 Fountains and water features abound. 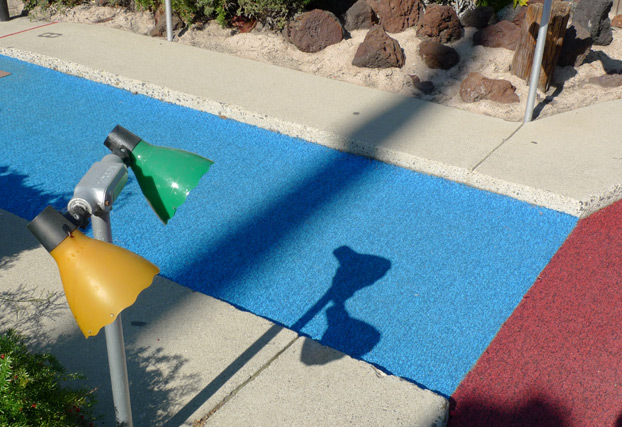 Here the greatest variety of landscape elements are woven together – the maroon and blue astroturf of the golfscape, the conspicuously thin (and definitely not up to modern accessibility standards) concrete walkway, the rock gardens and dinosaur-plants. The water features are contained within curved banks of painted concrete, creating a fully modernist sense of smoothness and flow. 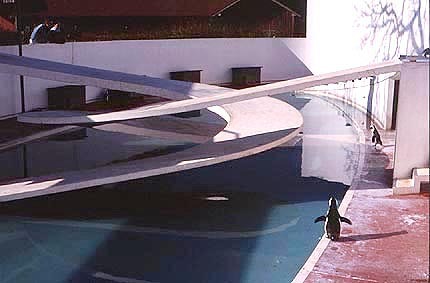 This scene invites comparison to the famed 1934 London Zoo Penguin Pool designed by Berthold Lubetkin. The style of this landscape – excessively graphic, colorful, delineated by swooping and linear forms – prefigures the later approach of High-Modernist “Landscape Urbanism” designers like West 8’s Adriaan Geuze and Field Operations’ James Corner. 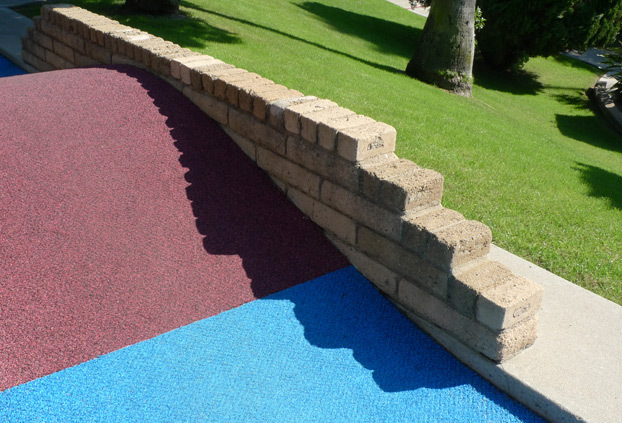 That maroon and blue turf transforms the earth’s surface into an abstract surface, like something one would craft in a digital model. The objects found within the park, such as the the planter boxes, the light fixtures in the image above and the tables in the image below, contribute to the atmosphere of the place. They are brightly colored and pure of form. 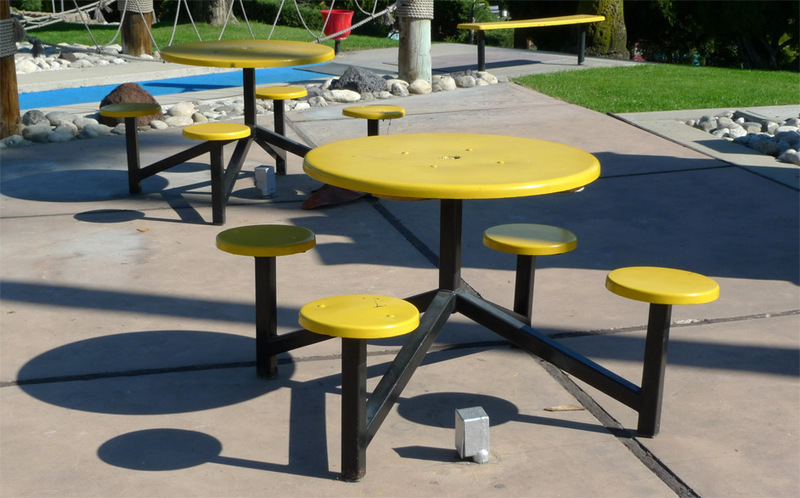 The tables of welded tube steel and bright discs of plastic cast evocative lollipop shadows. Camelot’s dominant style of Ye Olde England Moderne borrows an aesthetic from an historical milieu, mining it for ideas about materials and shapes that are then applied in an essentially modernist fashion. The Lomo method of historicizing differs from that of the Postmodernist method in significant ways. Whereas the latter made greater efforts either to be faithful to the rules of some established style or create a “double-coded” in-joke in an architectural language decipherable only to other architects, the lomo practitioner took inspiration from a select group of historical styles, primarily vernacular rather than High, and used them because they were familiar and legible to laypersons. 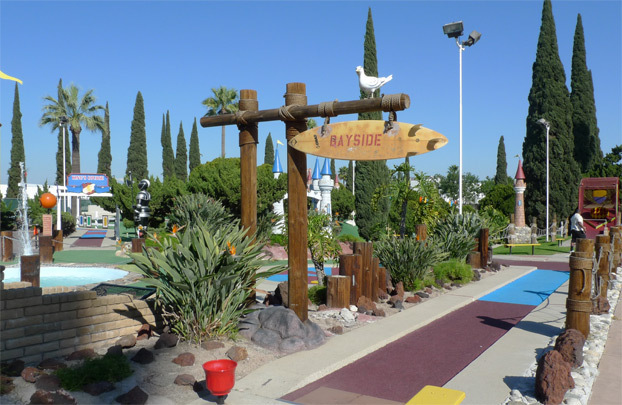 Aside from the Merrie King Arthur look that gives Camelot its name, the park features a multitude of lomo styles, with many individual “holes” decorated in distinct genres, such as the Heavy Timber Polynesian style seen in the image above. 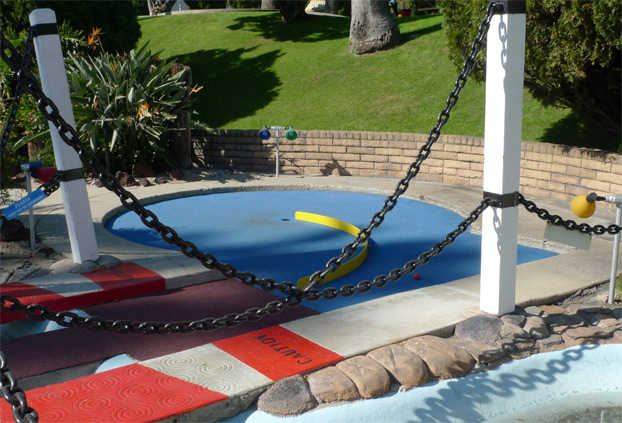 Much in the way that Disneyland comprises a Frontierland, Tomorrowland, Adventureland and Fantasyland, any 18-hole course at Camelot comprises at a much smaller scale a similar diversity of styles, and like those at Disneyland, they are predominantly Lomo in character. The menagerie of styles seen in Camelot’s golf courses reflects the range of choices available in the Lomo architect’s quiver. The sequential organization of the golf course pits these styles head-to-head, analogous to kung fu movies in which the Tiger style is pitted against the Snake Fist. In a more appropriately lomo example, the classic 1988 Jean-Claude Van Damme film Bloodsport consists entirely in the pleasures of watching the unexpected collision of disparate styles: Van Damme’s ninja-trained Frank Dux doing battle with a Thai kickboxer, a Sumo wrestler, and Bolo Yeung. This same formula was the basis for the arcade game Street Fighter and its successors and knockoffs. 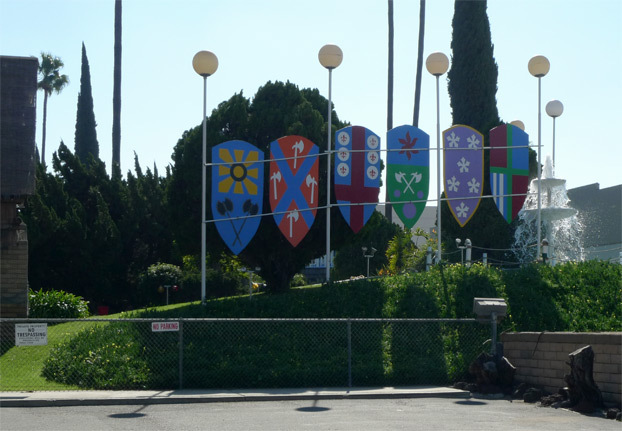 The styles employed at Camelot tend to be based in a vernacular, but even when their origins derive from more culturally distinguished precedents, they are rendered cartoon-like or miniaturized within the context of this playland.